CONFESSIONS OF A TV QUIZ ADDICT! Please note that many images contained within this website may be subject to copyright, although many have been kindly sent to me and intended to be shared on this non commercial outlet. If anybody wishes to use any of the same, then please get in touch as well as possibly giving credit where due as well as setting up reciprocal links if relevant to the actual content on any webpage. Please note that I am able to monitor any image-copying and if published on other websites. I would appreciate any contact to report broken/outdated links and any corrections to the text that accompanies any images herein. Thank you and enjoy! 2019- Now updated and available as a paperback! 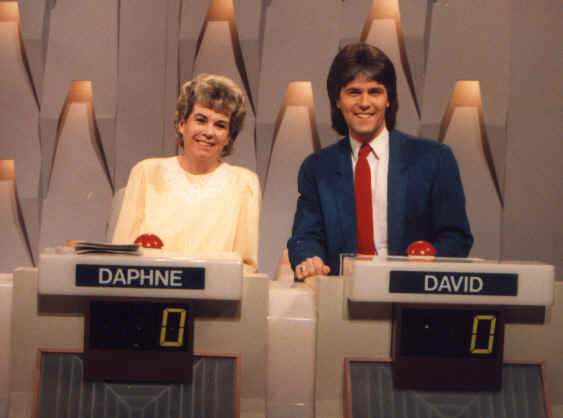 David St John is a professional comedy entertainer, with a lifetime of appearing on stages across the UK and overseas, who decided to try his luck on a TV quiz show in 1982. In July 2014, he was validated by the Guinness Book of World Records, with the most TV quiz show appearances. This book offers an insight to how to apply, audition and take part in a show, along with detailed chapters on each of his individual programmes. Read about the celebrity presenters and fellow contestants, with the experience of being in a television studio, being watched by millions of viewers as David battles against the many odds. Enjoy the amusing stories, along with many jokes that relate to each show title, with contributions from some well-known names. This is now available as an e-book (for digital download) on Kindle/Amazon - cheap as chips! This version can be read on phone, Kindle reader, tablet, PC etc. There are photographs, in colour and B&W via the e-book, but the paperback only features B&W images in line with the prohibitive costs of colour printing. The print-to-order book is priced just over £10.00 but this offers free postage via Amazon so works out better in comparison to a lower price plus postage etc. If you have any difficulty, then please e-mail me to order a copy plus I can sign it for you! I was inspired to write it, following the press/media interest in 2013/2014 as my TV quiz show background captured the imagination, as well as noting that most quiz-related books are merely collections of trivia questions etc. 'Yours Quizzically' highlights my own experiences in taking part in TV quiz shows, as well as meeting several big names along the way, plus the highs and lows of winning- or just losing a show! Have a laugh at the gags in between the descriptions of each show, as well as enjoying contributions from a few well-known names who kindly contributed. Click on the links below for more news and TV clips. Following on from my 2013/2014 national press coverage, I was contacted by the Guinness Book Of World Records, who accepted my claim and requested proof in the form of DVD footage of my transmitted quiz show appearances plus any relevant correspondence from the programme makers. I have appeared on 30 main shows but they count extra shows, by virtue of subsequent shows as a 'returning' champion etc. In fact, my claim was for 36 appearances but I have no footage of two shows at the moment so these may turn up soon. I can also be booked for speaking engagements, based on my thirty odd years of TV quizzing, with a short opening stand-up comedy routine, followed by tales of my experiences and even fielding trivia 'challenges' from the room! (Bring your own quiz sheets) A very unusual interactive speaker who combines professional comedy mixed with an inside look at the whole spectrum of TV quiz shows - read the book first to get a rough idea! In addition- I can host your own quiz evening, with a talk on my own story, so please get in touch for more information. David recently entertained our Speakers Corner with his experiences as a quiz show contestant. The number of shows he had entered was astonishing and he enlivened his account of them with jokes which made the talk both informative and amusing. He then allowed himself to be at the mercy of the audience to test his knowledge. A good time was had by all. Go back to Home Page to read about my main entertainment profile and much more!